Royal Bank of Scotland has said it is “on track” after seeing a £392m profit for the July-to-September period, with profits for the year so far now £1.3bn. 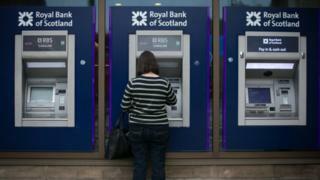 RBS said it was only the second time since 2008 that the bank had turned a profit for three consecutive quarters. However, the bank said it could not be sure of a full-year profit, since it was hoping to settle a dispute with the US Department of Justice. The cost of that settlement is likely to push RBS into a loss. It relates to claims that RBS mis-sold mortgage bonds leading up to the 2008 banking crisis. On Thursday, the bank settled a separate US criminal investigation that accused its traders of lying to clients over investments between 2008 and 2013. The Department of Justice (DoJ) said RBS would pay $44m (£33.4m) under the non-prosecution agreement. RBS said it had self-reported that issue to the US authorities and was pleased the matter was now resolved. The third-quarter profit compares with a loss of £469m for the same period last year. RBS said it had taken out £708m in costs as part of a simplification programme that had reduced the size of the business. The bank said it had made no further provision for mis-selling of payment protection insurance, while conduct and litigation costs were £125m for the quarter. “Our strategy to deliver a simpler, safer, customer-focused bank is working,” said RBS chief executive Ross McEwan. “We have grown income, reduced costs, made better use of our capital and continued to make progress on our legacy conduct issues. RBS is still 73% owned by the government following its emergency bailout in 2008. Earlier this week, the financial regulator, the Financial Conduct Authority, said it might take “further action” over the way RBS mistreated some small business customers. The FCA published an interim report into failings by the RBS division that dealt with struggling businesses, known as the Global Restructuring Group (GRG). The regulator flagged up “widespread” mistreatment of customers in some areas by the GRG. In response to the report, RBS said it had acknowledged failings and again apologised for its mistakes. “More progress, but no update on the DoJ investigation and the spectre of GRG still leaves a question mark over whether the bank really can return to profitability next year,” said Neil Wilson, senior market analyst at ETX Capital.